The magnificent second novel from the legendary author of One Flew Over the Cuckoo's Nest and Sailor Song is a wild-spirited and hugely powerful tale of an Oregon logging clan. A bitter strike is raging in a small lumber town along the Oregon coast. Bucking that strike out of sheer cussedness are the Stampers: Henry, the fiercely vital and overpowering patriarch; Hank, the son who has spent his life trying to live up to his father; and Viv, who fell in love with Hank's exuberant machismo but now finds it wearing thin. And then there is Leland, Henry's bookish younger son, who returns to his family on a mission of vengeance - and finds himself fulfilling it in ways he never imagined. Out of the Stamper family's rivalries and betrayals, Ken Kesey crafted a novel with the mythic impact of Greek tragedy. Ken Kesey was born in 1935 and grew up in Oregon. He graduated from the University of Oregon and later studied at Stanford with Wallace Stegner, Malcolm Cowley, Richard Scowcroft, and Frank O' Connor. One Flew Over the Cuckoo's Nest, his first novel, was published in 1962. 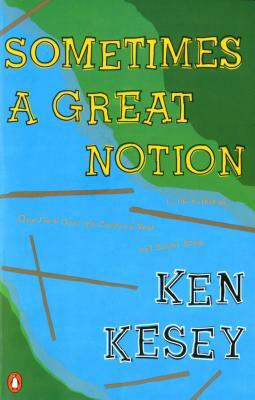 His second novel, Sometimes a Great Notion, followed in 1964. His other books include Kesey's Garage Sale, Demon Box, Caverns (with O. U. Levon), The Further Inquiry, Sailor Song, and Last Go Round (with Ken Babbs). His two children's books are Little Tricker the Squirrel Meets Big Double the Bear and The Sea Lion. Ken Kesey died on November 10, 2001. "As in Cuckoo's Nest, Kesey brings to life people you will never forget . . . Getting into this book is getting into a fascinating, crazy world of a fascinating, crazy family which has a throbbing reality and a desperate dedication to living . . . and then there is that great gift for comedy, for purely sensational writing. When Kesey describes the Canada honkers flying over the woods you can almost see them; when he describes the smells of the grass and the tastes of the strawberries you feel and you smell and you taste." "Sometimes a Great Notion, a big book in every way, captures the tenor of the post-Korea America as nothing I can remember reading . . . Beyond the PTA and the beer commercials, beyond the huge effluvium of the times, exist people who live by the ancient passions, and Mr. Kesey in the fullness of his material discovers them for us." "A tremendous achievement . . . Set against the damp and brutal background of an Oregon logging community, the book by turns gasps, pants, whoops, and shrieks . . . you cannot help but admire Kesey's vigor, his profligate command of the language. And you have to stand back in awe of the man's ability to create character."